This letter is from a reader, Gino on April 9, 2016. I want to thank you for opening my mind and providing a window down a path less travelled. Although we’ve never met or conversed, your writings and videos have served as our means of communication. My story starts in 1993, where a routine medical test for life insurance, discovered elevated protein levels in my urine. Ever since, I have regular blood work testing as well as monitoring of protein levels by both my family doctor and nephrologist. In the last year, without any advance warning, my fasting glucose and HbA1C steadily increased. 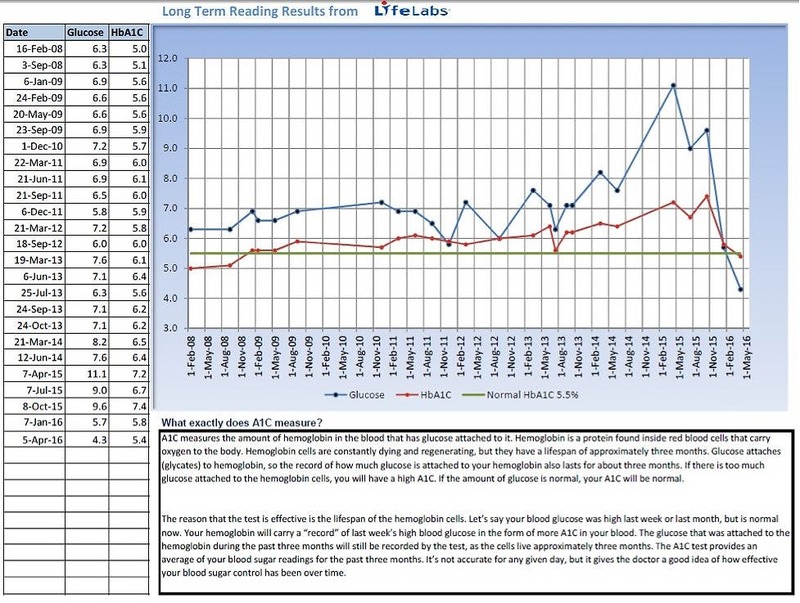 My doctor visit Oct 15/15 suggested I was diabetic and needed to seriously reduce my blood glucose levels as my HbA1C reached a personal high of 7.4. My doctor set an appointment for the Diabetic Clinic, and I requested a prescription for 1,000 strips and Glucose Meter. My plan was to measure blood sugar levels and monitor what foods, activity or emotions triggered higher glucose readings. I tested before/after meals, middle of the night, early morning and late at night (see attached 1-Summary of Glucose Readings). 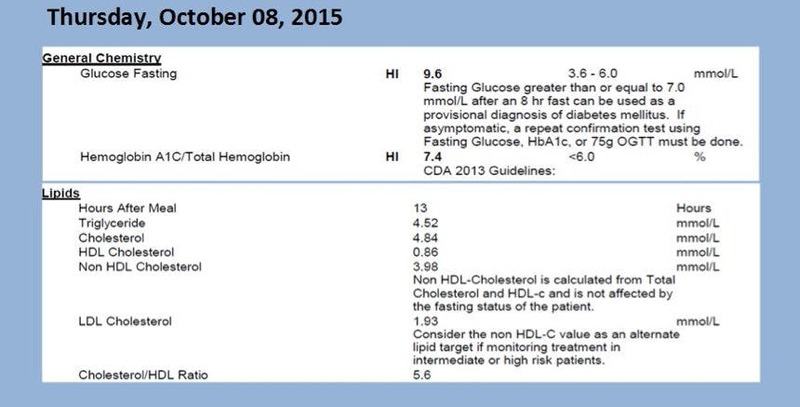 Between Oct 15th and Nov 19th I followed a Diabetic Glycemic Diet with minimal improvement. My visit November 19 to the Diabetic Clinic included: my weigh in (257 lbs); review blood work results; understand the Canadian Food Guide; discuss the importance of exercise, and more importantly, told to setup another appointment with my doctor and have Metformin prescribed. I took all the literature provided by the Diabetic Clinic and decided I would follow the diet and exercise regimen but delay my visit to my family doctor for Metformin. By December 12th it seemed useless – I reserved myself to the fact I needed medication to control my morning blood glucose level. I decided to review possible medications, dosages and side effects. The weekend of Dec 12-13/2015, I searched and reviewed online medical journals, diabetic organizations and anyplace in between that spoke about diabetes. My searching lead to a forum discussing treatments that worked for some individuals – that is where I found Dr. Jason Fung, a Nephrologist, U of T graduate (I’m a sucker to see what alumni are doing) -a kidney specialist who successfully treated patients with serious diabetes in the Toronto area. Since I also see a nephrologist for my kidneys, I was intrigued and decided to look you up. The website had written material, blogs and good references with easy to follow video series – explaining HFLC Diet, Intermittent Fasting, human body function, etc…. I spent that weekend immersed in your material and decided I had nothing to lose to at least try a HFLC Diet and Intermittent Fasting schedule and immediately started Monday Dec 14/15. The rest, as they say, is history – my results were immediate. I observed blood glucose readings in the “5’s” (haven’t seen that in awhile) as well as immediate weight loss. As I continued the HFLC Diet and Intermittent Fasting, I was forced to schedule fasting periods around Christmas, New Years, birthdays and family dinners. Although I regularly had a 24-hour fast schedule, I sometimes needed to vary my fasting period – at those times, I would use a 50% per week fasting target as my goal. I truly believe my organs just need a little time to recoup. I’ve now created an internal benchmark whereby an “indulgence” is managed back to “normal levels”. There were a couple of times the last few months where my blood sugar readings were quick reminders that “I over did it”. No panic, no concern, I was one HFLC meal away and a 24, 36 or 42 hour fast to normal readings (this is the most amazing and MOTIVATING part of all!). Fasting gives my organs a chance to revitalize and get ready for the next round……I actually look forward to my fasting period. 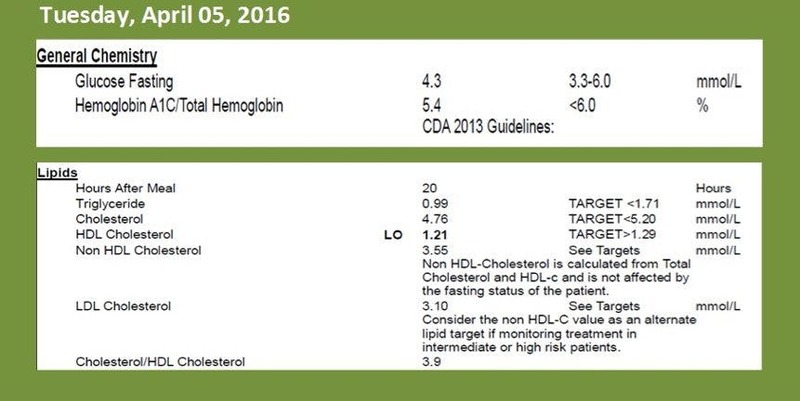 Below are my blood work results (including Lipids, as this was my consequential concern) for October 2015 and April 2016, in addition I’ve included photos of before (257 lbs. (117 kg)) and after (211 lbs. (96 kg)). Thank you Dr. Jason Fung, your help was, and is, invaluable! Please continue this great work. Amazing work, Gino, and congratulations! Thank you for sharing this with all of us. About that diabetes clinic – I wish this were the exception but I fear it is the norm. God forbid that you should get better by ignoring the terrible advice they gave you. Unfortunately, for most clinics, their pride is more important to them than your health. Once again, I’m always a little saddened by the fact that you needed to regain your health despite, not because of your medical professionals. On the other hand, I’m heartened by the fact that you can beat type 2 diabetes. I want to spread a message of hope for all those suffering from pre diabetes or diabetes. This is not the incurable disease that diabetes clinics want you to believe. You can take your health back into your own hands. There is another way forward, which is within our grasp immediately. There are no expensive medications. There are no experimental surgeries. The way back to health only requires an open mind and the knowledge that is freely available. wow! Great success story! Congrats . Fantastic news. It's great to see so much discussion happening about this incorrect information that we have been fed for the last 40 years. However, I do understand that the Medical community are finding it difficult to back down so publcly. I still think that Dr Robert Atkins had the correct idea in the 70s. Gino, congrats on your success. I could use a coach like you. If you are interested in helping someone like me let me know. I wish to THANK YOU for your excellent advice. I started intermittent fasting Monday 3 April 2017. My blood sugar Fell from 22.9 to 9 in less than a week. I Fast 23 hours a day and only eat 2 cups of mince at lunch time. I am astonished at the rapid results and it is not difficult to keep to this regimen at all. It has been months since I had blood sugar levels of less than 16.1. I cannot wait to see my blood sugar levels at 5 again.